Rim the glasses with sugar. Next, mix the vanilla vodka and soda. Pour into the martini glasses, until they are about 2/3 full. Pour a bit of the flavored liqueur into a glass so it is easy to access. Insert a drinking straw into one of the liqueurs, and cover the top end with your finger. Insert the straw into one of the filled martini glasses, and take your finger off the top of the straw, while gently drawing the straw upwards. The liqueur will settle in the bottom of the glass. Can’t get enough gumdrops? These gorgeous (and delicious!) cocktails look and taste just like the candy! I have Gumdrop Fever, which is a condition caused by a severe lack of gumdrops. The batch of adorable Homemade Gumdrops I just made hasn’t nearly satiated my desire for sugar-coated gumdrop goodness. So, Gumdrop Cocktail, anyone? You’ll need martini glasses, vanilla or whipped cream vodka, a little lemon-lime soda, and flavored liqueurs. Use your favorites or what you have on hand. Cinnamon, peppermint, anything berry, or orange is lovely. If the liqueurs are clear, add a bit of food coloring. Oh, don't forget to have a drinking straw on hand! First, coat the rim in colored sugar as it's an essential component of the gumdrop experience. This can be accomplished in one of two ways. One is to moisten the edge of a martini glass with an orange or a lemon, and then dip into the sugar. The other is to run a tiny bit of vanilla frosting around the rim and then dip into the sugar. I went the frosting route because I was making a bunch of different flavors. Next, mix the vanilla vodka and soda. Pour into the martini glasses until they are about 2/3 full. Then, in separate glasses, pour a bit of each colored liqueur so they are easy to access. Insert a drinking straw into one of the liqueurs, and cover the top end with your finger. Insert the straw into one of the vodka and soda filled martini glasses, and take your finger off the top of the straw, while gently drawing the straw upwards. The liqueur will settle in the bottom of the glass, for a beautifully colorful cocktail. 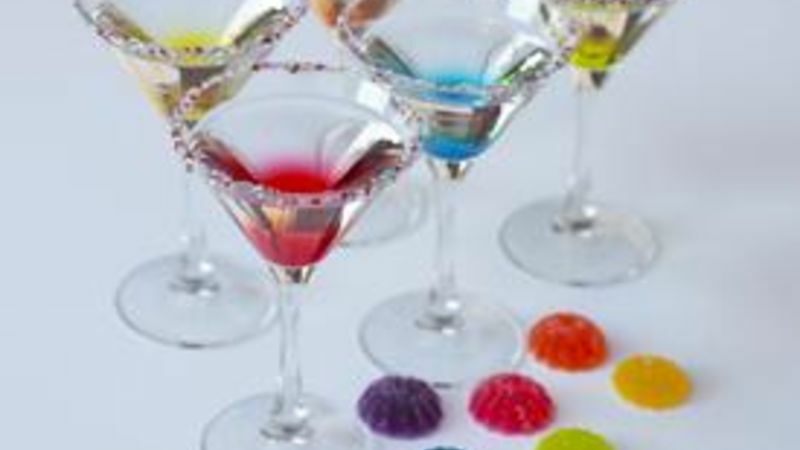 Repeat with the rest of the martini glasses and serve with your Homemade Gumdrops!